What if you could find a healthy green vegetable that is packed with nutrients, contains antioxidants and can help you lose weight? You’d buy it, wouldn’t you? Well, kale has all of these properties, so this superfood is the perfect addition to your shopping list. 1. Kale is one of the best sources of vitamin K, which is necessary for blood clotting and bone health and can help prevent atherosclerosis. Low levels of vitamin K are associated with an increased risk of Alzheimer’s disease. In fact, kale contains so much vitamin K – more than 600% of the USDA’s recommended intake – that it can interfere with drugs that help thin the blood. If you’re taking aspirin or another anticoagulant, such as Warfarin, to prevent a heart attack or stroke, kale might not be right for you. 2. It contains antioxidants, including flavonoids and vitamins A and C, which can prevent free radical damage. Quercetin, a flavonoid found in kale, may help prevent inflammation. Vitamin A is important for healthy eyesight and healthy immune function. Vitamin C is also necessary for a healthy immune system. 3. Kale contains healthy minerals, including calcium, iron and manganese. Calcium and manganese are essential for healthy bones and teeth. Calcium also plays a role in blood pressure regulation. Iron is a major component of hemoglobin; the substance in red blood cells that transports oxygen around the body. Iron is needed for proper liver function. The iron and calcium in kale make it a great diet choice for people who don’t eat meat and for people who avoid dairy products. 4. It’s a source of Omega-3 fatty acids, which reduces the risk of coronary heart disease. 5. Kale contains the compound sulforaphane, which has antibiotic properties. Some research suggests that sulforaphane may help prevent some types of cancer. 6. Kale can help you lose weight. 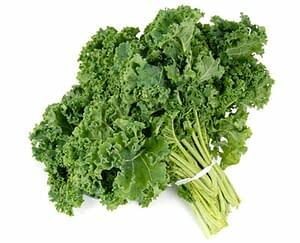 One cup of cooked, unsalted kale contains only about 30 calories. Kale is high in fiber, so it makes you feel full more quickly, which means you will eat less. 7. The fiber in kale decreases your risk of heart disease, stroke, high blood pressure and diabetes. Fiber helps to lower blood cholesterol levels and keep blood sugar levels under control. 8. Kale is easy to prepare. You can add it to a salad or to soup, boil it or saute it. Kale can be part of a healthy smoothie. You might want to try making kale chips, a great replacement for potato chips when you’re craving a snack. Check the salt content, and watch out for preservatives when buying kale chips in a store. Kale is so nutrient-rich that during World War II, it was often grown in victory gardens so that people could obtain essential nutrients despite wartime rationing. When you buy kale, buy organic. Unfortunately, kale growers often use pesticides that can harm your nervous system.